Today I decided to back to my favorite family of polish colours, dark jewel tones. The LadyVarnishes has two polishes call Raven King in her shop. One is a holographic polish and one is a duochrome. I decided to try to the duochrome version. Raven King is a dark shimmery blurple with a green micro fleck glitter. The results is a deep shimmer that really comes to life in sunlight. The polish shifts between purple and blue depending on lighting and the angle you look at it. The formula was great. It was easy to work with and took two coats to get opaque. It dries to a satin finish so if you want a really glossy look you'll just need to use a shiny top coat. All pictures show two coats of Raven King with one coat of CND Super Shiney top coat in natural sunlight. 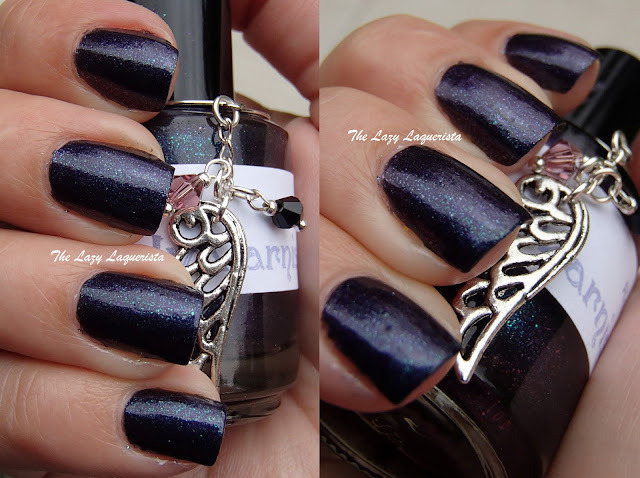 This a great polish if you love darker colours like me. I might toss a matte top coat on this later and see how the shimmer shines through. If you like what you see you can get your very own bottle from her Etsy shop at https://www.etsy.com/shop/TheLadyVarnishes. What do you think of this polish? This is so beautiful... I have been debating getting this polish but now I really want it! It is very nice. I love how dark it is. In my personal experience most duochromes tend to be medium colours and you had to layer them over a dark base colour to get a dark duochrome. This one does it all on its own though.